I’ve done that more times than I’d care to remember. He who has not Christmas in his heart will not find it under a tree. To be more honest, my Christmas plans have been cancelled by my tour company. I had arranged to fly out to the Algarve in Portugal on December 19th, to spend Christmas in the sun with a group of other like-minded solo travellers. It should have been fun. Sadly my tour company has just emailed me to say that ‘they have decided not to proceed with this group departure’. Their reason….. the minimum number of guests has not been achieved . Disappointed? You bet I am. They have offered me 7 alternative Christmas Holidays, all of which are more expensive, and none of them to places I want to spend Christmas ~ such as Agadir in Morocco. And, they will send me a refund for the $1300 or so I have already paid for my trip to Portugal. So, unless I want to spend Christmas alone in my apartment again, I need to find somewhere to go at short notice. Ah well, the spirit of Christmas still lives in my heart. For some it’s heir favourite time of the year ~ others aren’t always so fortunate, so we’ll try hard to make this a happy Christmas for the whole world. Anyway, back to food for this Christmas. I’ve no doubt that you’ve got all the main stuff organised ~ the Christmas Dinner I mean. But what about all those snacks, and breakfasts, and afternoon teas that you’re going to want to provide over this festive season? What about all those extras? Well, this Food on Friday might just give you some good ideas. First this week we have this really cool snowflake pull-apart monkey bread from Tieghan at Half Baked Harvest. Loaded with butterscotch and cinnamon ~ what a great breakfast, or something extra sweet to have with your afternoon tea! From No Plate Like Home, how about this eggnog quick bread with rum infused glaze? What a great idea for afternoon tea, or for something to have at parties. You know what? I’ll bet this will go down a treat. Next from the archives of Amanda at Chez le Rêve Français we have this Christmas tarted up treacle tart with ginger and pecans. Jeez! This looks so rich and tasty~ I love treacle tart! Now for something that’s a cross between sweet and savory ~ from Elise Bauer at Simply Recipes we have honey hazelnut baked brie. I really like baked brie, and this recipe looks fabulous with a sweet and sour honey sauce. Here’s something sweet and irresistible from Averie Cooks; melt in your mouth toffee. Averie says it’s perfect for cookie exchanges, or as a hostess gift, or for parties. This toffee looks good to me. Well, something no drinks party should be without is a brilliant cheese board. So Chungah at Damn Delicious offers us some tips on how to create the perfect holiday cheese board. Looks damn delicious to me. And, talking about drinks, Country Living has this brilliant collection of drinks recipes; 30 Christmas cocktails for a holly jolly holiday season. Among the recipes is this cool white Christmas mojito from Half Baked Harvest. Feeling a greater sense of meaning and purpose in Life. An American friend has sent me a most wonderful and thoughtful Christmas gift ~ which I have already opened! It’s a book; Rituals for Living, Dreambook and Planner. When I say it’s a book it’s kind of a journal, and diary, and project planner. The project in this case being My Life. It’s about connecting with what’s really important to me; identifying my core values, gifts, and life purpose. It’s also about developing habits and rituals to help me to realise my dreams. At heart I am an engineer, I like planning, I need to make plans before starting any new enterprise or project. Well, this is a new project, it’s the rest of my life. A big project that deserves some big plans. I firmly believe that this book, the gift my American friend has sent to me, will help me achieve my fullest potential and realise my dreams. In part it’s about self-awareness and self-actualisation, and in part it’s about developing habits and rituals which will lead towards the fullest and most congruent realisation of my desires, dreams, and goals. You know what? This is a wonderful gift, and I know it was sent to me with love. Marmaduke has seen me looking at the internet ~ making plans for this year’s Christmas and New Year Holidays. As I’m not taking him to Barcelona next week he’s worried that I won’t be taking him along this Christmas, so he’s been making his own Christmas plans. Where ever Marmaduke is thinking of going for his Christmas Dinner, I’m thinking of a Christmas Caribbean cruise~ providing I can find the right girl to take along. At this time of year, when we’re busy with shopping for gifts, food shopping, visiting family and friends, it’s easy just to eat snacks on the run. It’s also very easy to get very bored with turkey. Here are some fairly simple dishes you can cook to make your pre and post Christmas evenings, lunchtimes, and mornings a little more interesting. Tieghan Gerard at Half Baked harvest has given us this pancetta wrapped pork tenderloin, looks delicious, and I will be definitely making this dish for dinner on Christmas Eve. There is some real comfort food here to take away the stresses of Yuletide. Chungah at Damn delicious offers us sheet pan steak and veggies. You can’t find an easier meal than this and it looks damn delicious too. The lovely Averie at Averie cooks has this dead simple dish of curry coconut sweet potato fries with cucumber dill dip. Great to snack on or as a side dish with steak or pancetta wrapped pork tenderloin. Something a little different from Cooking Without Limits; nests of meat stuffed wine vines rolls for Christmas. I’ve had these in Greece, and I can tell you they are a fabulous dish. If you have a house full of guests over Christmas, just what can you make at breakfast time that doesn’t involve loads of pans and mess. Well, thanks to Elise Baur at Simply Recipes and Sheryl Julian, you can make this ham and cheese breakfast casserole, and it will satisfy the hungriest house guest. I really like lamb, and although I don’t cook it often, I will be roasting a leg of lamb for this coming New Year’s Eve. So this recipe for slow roast lamb with ancho chilli and garlic marinade from Australian Cooking Up The Pantry is very apposite today. But beware, this dish will take around 6 hours in the oven. Finally for this week, and with thanks to the very uncool Readers Digest we have this cool collection of 20+ perfect Christmas appetisers, including these onion and brie tartlets. My little teddy bear likes to do a bit of woodwork. And, like me, he’d rather make a Christmas present than buy one. There’s more love and care in something one has made, as opposed to something you’ve bought at the store. So he’s been making me a coffee table for Christmas. Marmaduke may have an ulterior motive in making this little table ~ it’s just the right size for him to have a clandestine teddy bears’ picnic. Some people like parties, and some people like drinking. For people who like a lot of both, here are some drinks that should probably go down well at Christmas Parties. Good Grief! Remember, anyone can make a really strong cocktail that will get people very drunk very fast ~ but how good a party does that make? So here are some more tastefully interesting drinks. First up this week is a great looking cocktail I found on Jessica Merchant’s site how sweet it is we have this great recipe for rose champagne mojitos. I would serve these to my discerning guests. For a different take on the mojito, Tieghan Gerard at Half Baked Harvest gives us this brilliant looking White Christmas Mojito. If your guests arrive cold and shivery, Tieghan also had a smashing recipe for hot maple apple cider in Food on Friday # 48, which was about apples. Here’s something for a Californian Christmas. Recovering pastry chef, the bojon gourmet has these rosemary, pomegranate and grilled meyer lemon vodka sparklers. Don’t try saying all that after drinking five or six of those things. From Chungah at Damn Delicious there’s a simple and easy strawberry pineapple mimosa, although in England we call champagne and orange juice Buck’s Fizz, and we make it a lot stronger. Add a splash of brandy to that and you’ve got yourself a fresh juice Barbotage. Consume that Barbotage very carefully. This recipe for holiday rum punch, by Tracy Shutterbean, (aka Tracy Benjamin), is straight from the San Francisco bay area. I’ve drunk rum punch in San Francisco, and I know that if you’re not careful this punch could get you very drunk. Nice. At some time during your own party, you may want to retire to a quiet corner, perhaps with a special friend, and enjoy a glass of the water of life. If you don’t know about whisky, here’s a post from Todd and Diane in LA, the White On Rice Couple, telling you all about the different types of whisk(e)y. 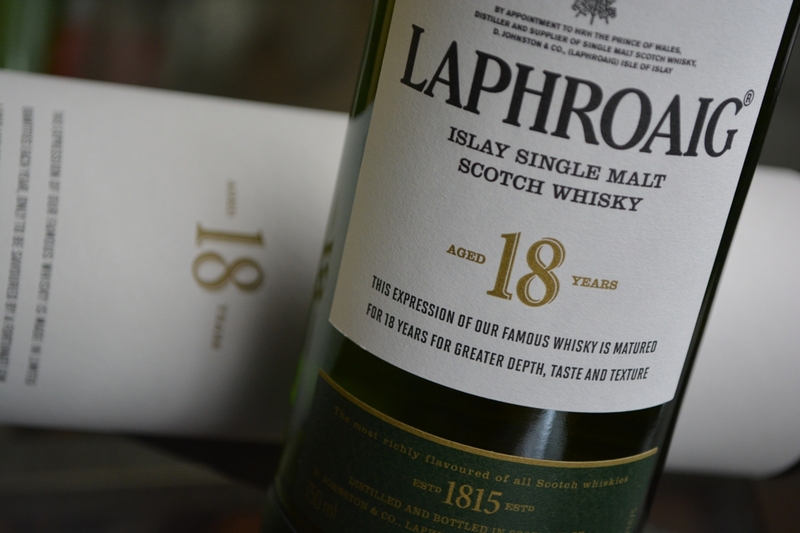 Back in the day I drank Laphroaig ~ too strong and too sophisticated for most ordinary men. If all that wasn’t enough, from Country Living magazine here are 28 Christmas cocktails that will make you forget all about the presents. These are are pretty easy, including this winter wonderland cocktail, originally from Nicole at the Marvelous Misadventures of a Foodie. How about some appetisers to go with all this booze? Heather Christo has the ultimate vegan appetizer platter, Damn Delicious has cheesy garlic bread, and easy firecracker shrimp, Cooking up the Pantry has cheese and mustard puffs, Half Baked Harvest has a cheese fondue board, or you can check out Food on Friday # 25 ~ Bar Snacks. just don’t be a crass American and serve beers in the bottle, give your guests a glass.